Keep the Carne in Christmas! I may have been heard to utter this catchy phrase at one point in my life. Now, it seems to me nothing more than noise or the rallying cry of the self-righteous. It sounds to me like a plea to restore a fabled Christian past that never truly existed. We can inspire and motivate people with short slogans, and they may call themselves Christians, but invoking the name of Christ does not make a person a disciple of the living Lord. And the name is used in vain if it is used to rally people for a cause or religion rather than to the One who has come among us – the one who has come in the flesh (con carne). They say that they want to reclaim the “Christ” in Christmas, but they do not truly long for the Christ-child, the God made flesh. They long for a past when people could look past minorities and assume that everyone was a good, “Christian” person. By “Christian,” they mean someone predictable and “like me.” The cry sounds to me like the call for a time when it was socially acceptable for Christians to oppress other people. It sounds like the Crusaders’ cry of “Deus vult!” before they charged the heathens (or their Orthodox brothers and sisters). Amos may have a thing or two to say about our self-righteous celebration of Christmas: “I hate, I reject your festivals; I don’t enjoy your joyous assemblies. Take away the noise of your songs!” (Amos 5:21, 23). Even those pretty Christmas songs, Amos? If we don’t have our festivals and songs, what good is Christmas? Amos continues: “But let justice roll down like waters, and righteousness like an ever-flowing stream” (Amos 5:24). The truth is that life would be much easier if everyone just acted the way I wanted them to. Admitting that this is not a “Christian” nation (and never has been!) means admitting that there are other people with real thoughts, feelings, and desires out there in this world and in this country. It means not only making space for these people, but encountering their humanity and even taking risks on their behalf. In short, it means being Christ-like. Jesus Christ, the quintessential place-sharer, went out of his way to encounter the marginalized and oppressed. He encountered the Samaritan woman, the hated tax collectors, the lepers, the woman labeled “unclean” because of her bleeding, and countless others. He sought justice for the poor and oppressed, and he dismantled the religious trappings of his day to uncover what God was really after. People love to co-opt the name “Christ” (or “God,” if they are politicians) for their own purposes. Even the faithful get confused. John the Baptist himself was utterly bewildered at the actions of the living, flesh-and-blood Lord. You remember what he asked? “Are you the one who is coming (that is, the Christ), or should we look for someone else?” (Luke 7:20). Stop chanting slogans and consider Jesus’ answer: “Go, report to John what you have seen and heard. Those who were blind are able to see. Those who were crippled now walk. People with skin diseases are cleansed. Those who were deaf now hear. Those who were dead are raised up. And good news is preached to the poor.” (Luke 7:22). Real ministry is happening right now, right in front of you. Open your eyes and see Christ at work in the world. Open your ears and hear. Stop chasing after an idea, and reach out in love to your neighbor, the real person in front of you. There, you will find Christmas, Immanuel: the Christ-child come among us. I don’t want a popular, palatable religion. I don’t want a religion that is socially accepted. I want the Christ-child. 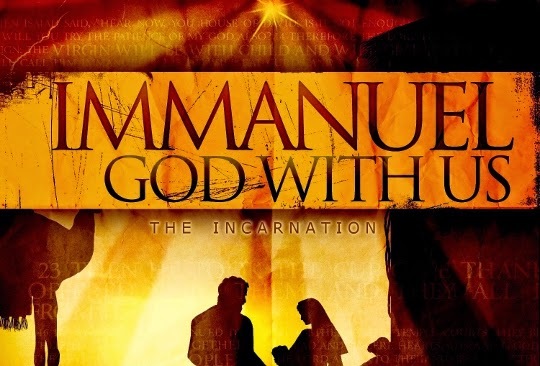 I want Immanuel. I want the God whose very name the faithful do not utter for fear of its misuse. This is the God who took on flesh and bone, who walked the wilderness of the world. In taking on flesh and bone, God revealed God’s self to be found in personhood, and that is where we find the living Christ active in the world today. Not in slogans. Not in religious trappings. In flesh. Con carne. That is the meaning of the word incarnation (literally, taking on meat), and that is what we proclaim and celebrate this season. Keep the kitsch. Keep the disembodied, amorphous, pithy sayings and sensibilities. Give me flesh and bone. Because we don’t need more billboards. We need justice. We need love. We need the living Christ.